It is that time of the year again. The boots are coming out with the soft woollens and cosy knits. I have to admit I love this time of year. I often find renewed energy and focus to buckle down on projects that perhaps I have neglected to the warm sun and light evenings. Is it because of the colors I see in nature that I tend to turn my wardrobe into browns and reds? I cannot really say, but I find even in my weaving I want bold rich earthy tones. This year I have found myself thinking more of the woodland theme and so I have made two particular pieces which reflect my love of the woods and also the mystery and romance it still holds for me. The first is a badger inspired hooded scarf. 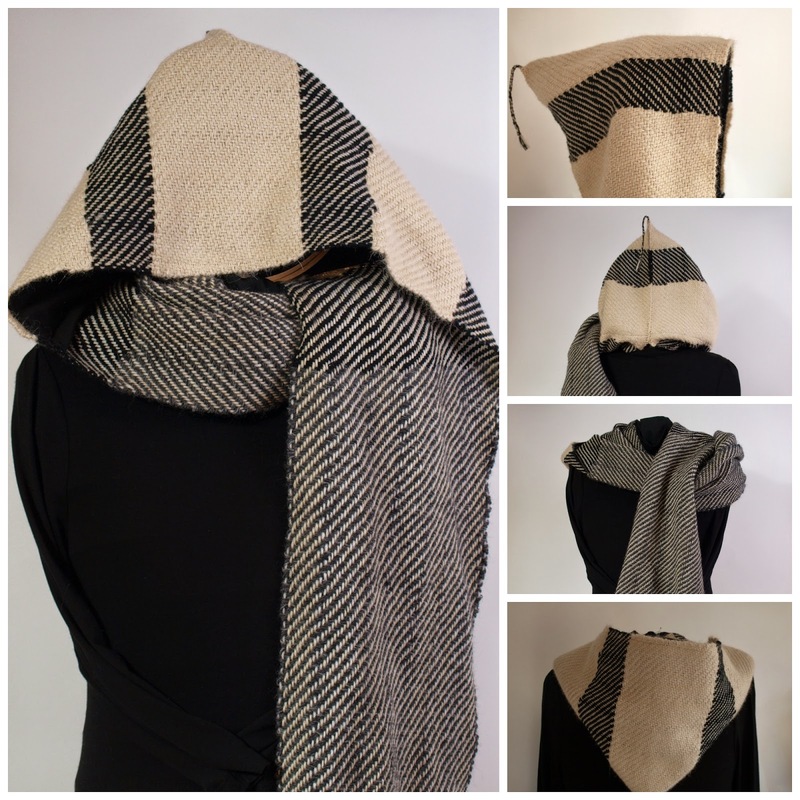 This hand woven hooded scarf is made from wool and alpaca mixed yarns in stripes of grey, black and cream. It is very cosy and soft because of the alpaca wool mix. In addition the hood is lined for extra comfort with lovely, soft, black jersey knit fabric to help combat cold. The lining also adds more 'structure' to the hood so that it gathers nicely when down and it holds shape when up. To the ‘brim’ of the hood has been added another layer of stiffened liner so that it does not fall and keeps its shape. All of the features to the hood makes it a little more 'damp proof’ for British Winters and makes it a unique piece to add to your wardrobe. I am donating 10% from the sale of this scarf to stop the badger culls in the UK. I really wanted to capture a bit of the spirit of the badger in this piece. I kept thinking of something which could be practically worn, but would also be a good representation of this popular totem animal. 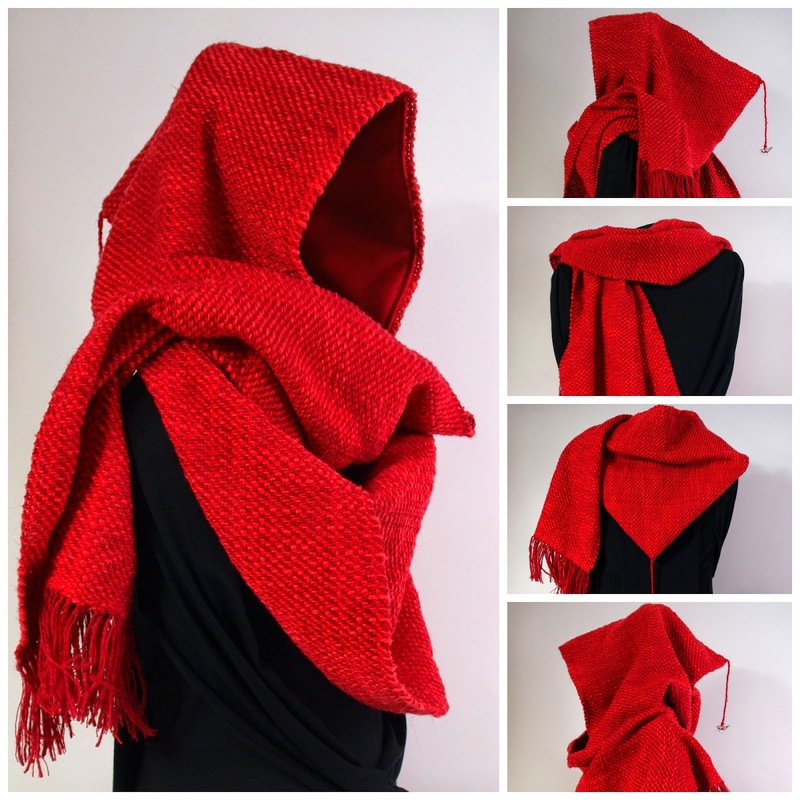 The second is a Little Red Riding Hood inspired hooded scarf. This handwoven hooded scarf is made from cotton and wool in 4 shades of brilliant red. The dark red wool is vintage, hand-spun wool from a lovely batch I purchased from and estate sale a number of years back; it has an amazing deep scarlet color and lovely roughly hewn texture while keeping the softness of wool. I added 3 cotton yarns to the mix in additional shades of red ranging from fiery to soft because I wanted the fabric to have the rich yet varied look of a garment woven a long time ago. I really wanted to create a practical yet romantic rendition of a hood for Little Red Riding Hood. The hood is lined for extra comfort with lovely, soft, deep red jersey knit fabric to help combat cold. The lining also adds more 'structure' to the oversized hood so that it gathers nicely when down and it holds shape when up. The ‘brim’ of the hood has been stiffened with another liner so that it does not fall and keeps its swooping shape. I added a little silver wolf charm hanging from the tassel in the back as a small detail to round the piece off and add to the romance of this piece. I again wanted to have a piece which really is practical and yet ultimately is closely tied to the magic and mystery of the fairytale. Both pieces can be found in my Etsy shop or in a special showcase page on FB. Inspired by something you have seen? Message me on FaceBook.